I’ve been focusing in on the importance of self-care and self-awareness lately, and one of the essential components of it is to know what you need and when you need it. As usual, I am writing this post as much for myself as I am writing it for you. I feel like our home and possessions are out of balance these days, so I need to take a moment to evaluate the root cause of that (I’m guessing that it’s overwhelming busyness). Let’s take a look at what a middle-of-the-road self check-in might look like. Commutes and random time spent waiting at a coffee shop for a friend are good times to do a quick alignment check, but to really dive in you should give yourself the time and space you need. Grab a notebook (even if you don’t use it – am I the only one who thinks better when I have a notebook nearby?) and a beverage and set up camp in a comfortable space. Allow yourself the pleasure of an uninterrupted span of time (I’m going to go with 30 minutes). You might want to add more or only focus on one of these at a time, but here’s a good place to start. This is where you ask yourself about the state of your heart. Are you feeling full and whole? Do you feel balanced, or are there things nagging at your gut that you haven’t fully addressed? Get in the habit of digging deeper to find what is truly at the heart of the matter. Here is also the place to ask yourself about your relationships – with yourself and with others. Are you connecting in the way that you want to? Do you need another friend to fill a space you currently are missing, or do you need to say goodbye to someone who is detracting from your happiness? This is the one I’ve been focusing on lately. It’s a different way of approaching your gut! Is the beautiful machine that is your body functioning as it should? Are you aching or stiff from sitting all day? Are you pushing yourself too hard? Many of us are too tough on our bodies, so approach this check-in with a lot of love and kindness for yourself. Don’t make it an opportunity for harsh self-criticism, focus on positive ways you can serve that already miraculous body of yours so it can serve you back. Allowing yourself to stagnate is easy once you’re out of the structure of a school. Here is where you ask yourself what you’ve learned lately. What are you excited about learning? Do you currently have projects that you are passionate about and motivated to work on? Now is also the time to ask yourself about your current goals. What is guiding you right now? Is it a solid guiding principal or is it a vague direction? Whatever your answer to that question should be followed up with this: is that how I want it to be? After each check-in, ask yourself why you feel that way. Filtering your grievances through a few layers of “whys” will help you discover the values behind them. Maybe the real reason your are frustrated with clutter in your home is that you don’t find your space inspiring. From there, evaluate if there’s a way to address the issue. Search for other spaces that you feel are more inspiring, or seek out ways to create a truly inspiring home from what you already have. This is the most important part – if you’ve had headaches lately, don’t just stop at that. Find out if it’s caffeine or sugar or stress and then actively seek answers. Warm downs are important when you’re exercising, and I don’t see this as any different. Bring yourself back from the check-in by listing five things you are grateful for right now. Just like with each check-in, ask yourself why you are grateful for these things. Reflecting on what you are grateful for (and, in my opinion, why you are) makes for a happy brain. Simple living and intentional living are one and the same: you can’t have a simple life without knowing yourself and knowing the intentions that drive you. So what do you need to check in on today? I’ve been traveling and taking on new work projects this month, which means something has had to give. And that something, unfortunately, is something I love: writing. I’ve been considering writing this post for some time now, but it’s hard to write about this topic when I know I’m a big offender of not giving myself the permission I need to do things I enjoy. What do I mean by giving yourself permission? Ultimately, it’s about allowing myself to stop being caught up in housework and regular work to enjoy my day a little bit more. It’s about being nice enough to yourself to take opportunities when they are available. When I was a kid, I had to ask for permission to have a Mountain Dew (which, looking back, was probably not a good idea to begin with). I had to ask permission to go to friends’ houses for the night. I was so excited, as I’m sure most of you were, to become an adult and be able to do what I wanted to do when I wanted to do it. But then came the responsibilities and the stress. Self-denial came along too. I find myself denying a cup of coffee when I really want to sit, sip and relax. I deny myself short walks outside because there’s work to be done. I realized that my “childish” desires (to write, to play with my rabbits, to indulge in a tasty beverage) are still there. They’re just waiting for permission to happen – my permission. 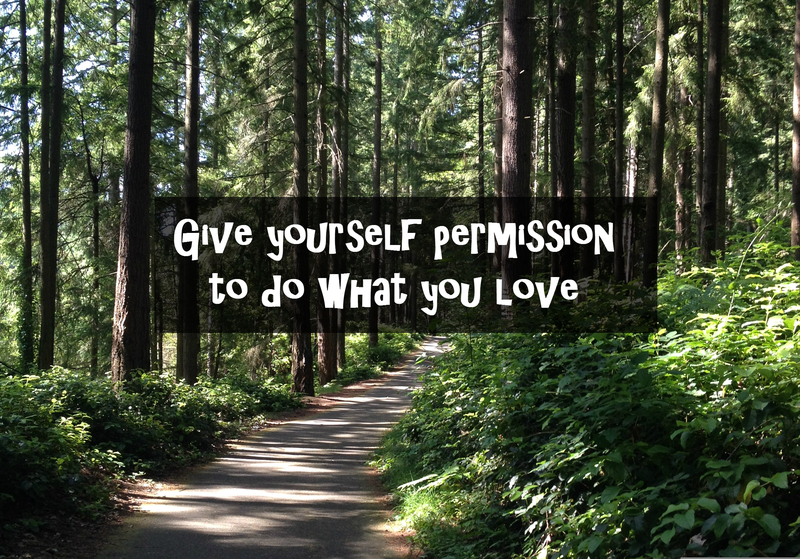 Take a moment to consider what you find difficult to give yourself permission to do. Is it something that would be positive and fulfilling? Is it healthy? Then say yes. Once you’ve evaluated what it is that you’d really like to be doing, learn to say yes. I know this comes as common sense to some people, but the more tightly-wound will understand what I mean. It’s so hard to break away from housework, real work and other obligations even when the alternative is a positive one. Say yes to peeling your eyes off of this computer screen and stepping outside for a moment. Say yes to cooking something amazing. Say yes to writing that blog post you’ve been meaning to write. So what do you say no to and what do you say yes to? I’ve started setting some goals and building principles for myself to help me choose the right balance between the two. What do I want most for myself? What do I want most for my home and possessions? What do I want most for my loved ones? If saying yes takes you closer to that goal, then say yes. If saying no takes you closer to the goal, then say no. Always do what moves you closer to your goals. Sometimes, that means taking a break and drinking coffee while reading a book you can get lost in. I’m still working it all out. But one thing’s for sure – this blog has helped me to hone in on what makes me feel most alive. It’s helped me to say yes a little more often. As I write this, I’m sipping tea in a cafe, which took a lot of permission for me to get out of the house and stop working for a while. What do you find difficult to say no to? What should you start saying yes to more often?